A great way to bring your garden to life. Friendly, easily tamed they will follow you around the garden to see what your up to! The Light Sussex originated in the county of Sussex. They were prized table birds more than 100 years ago. The Light Sussex today is still a very popular breed to keep. Bred to be a dual purpose bird, it is one of the most productive breeds we have today. The hen will lay around 260 large eggs that are cream to light brown in colour. The Sussex is one of the oldest breeds that are still in existence today. The Light Sussex chicken is an alert but docile breed that can adapt to any surrounding easily. They are good foragers. Whilst they are quite happy to be free range, they will also be fine if kept in a confined space. They can occasionally but not very often go broody. The Rhode Island Red is a utility bird, raised for both meat and eggs, and also as show birds. They are a popular choice for the back garden, because of their hardiness. The Rhode Island Red was developed in the US state of Rhode Island in the 1890s. The Rhode Island is another bird created for both meat and eggs, producing up to 275 eggs a year. The breed arrived in the UK in 1903 and became extremely popular very quickly. The Rhode Island Red is possibly the best-known breed in the world today. Rhode Island Reds are classed as a heavy breed, but are active. They enjoy foraging on grass. They are bright and alert but at the same time quiet. They make great pets and are relatively hardy. The Maran is easy to look after. They will produce around 150 deep, dark brown eggs each year. Maran is quite active, taking well to free ranging in rough terrain and are also tough and disease-resistant and are quite placid in nature. They were originally bred in the marshy areas of France and can cope with damper. Popular as a dual purpose bird, known both, for it’s extremely dark eggs as well as for its very fine meat qualities. The original Maran had feathered legs but this has been bred out by many UK breeders. The White Star is a leghorn cross. The genuine White Star is a Dutch bred Leghorn hybrid. White Stars are lovely dainty little chickens based on Leghorns, they are very pretty when fully mature and have large floppy red combs. They are slight, small, neat and compact birds compared to other hybrids. They are very inquisitive and can become very friendly, but if they don't want to be picked up they can run fast! White Stars lay a surprisingly large egg, are excellent layers and they will lay around 300-320 pure white eggs a year. The eggs are china white. The Pekin is a very gentle bird. They are good layers of small eggs but are broody, making them great mums. They make excellent pets for children as they are tame. They settle very well and require little space. They tend not to scratch around in flower beds, so are good birds to keep in an urban garden. They are normally a robust and long-lived bird that loves company. Pekins are a very popular breed here in the UK. They are available in a whole range of colours. Here we have Lavender and Lemon both colours may throw cuckoo. With all their feathers they actually look larger than they really are. All colours have bobtails, short legs and feathered legs. The Wyandotte has been noted for being incredibly docile, yet friendly and combined with their easy maintainability are a favourite with those new to raising chickens. This breed suits both free range and confinement to a run. This Silver Laced Wyandotte Bantam is a joy to keep, as they eat very little, look great and lay lots of small sized eggs. They are a hardy breed, laying through most of the winter. Hybrid hens have been developed through selectively cross-breeding the most productive strains of pure-breed layers. While some characteristics of the original parent stock may remain, hybrid hens are especially bred to be docile, not to go broody and to lay numerous eggs in their first year. The best of them can produce an egg almost every day – at their peak four hens could give you two dozen eggs a week! Hybrid hens were first created to meet the demands of the egg industry. Egg-laying ‘machines,’ they were designed to be kept in battery cages and lay prolifically for the first year of their lives. The small brown hens of this type are still used both commercially and as domestic layers. However, with the increased popularity of chicken-keeping, several other varieties of hybrids have been developed to provide a wider choice of hens and egg colours. 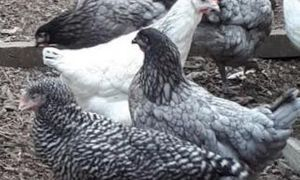 Individual suppliers tend to bestow different names on the hybrids they produce, leading to a confusing variety of aliases for what is effectively the same type of hen.